Roger MozBot was exhausted. It was May 2018 and another day at Moz HQ had passed, full of high-fives and hugs for the staff, helping out with the office tours, and supplying the building with all of its electricity (one of Roger’s lesser known, but super-crucial tasks). Now, he was running low on charge. Desperately low. But there was a problem. He had misplaced his charger. He searched, roaming the halls and corridors of Moz’s Seattle office, long after everyone had clocked off and gone home for the day. It was then, that he noticed something… different. “Huh? I didn’t know Dr Pete had his own office here?” Roger said to himself. He’d spotted a door he’d never seen before, despite touring the building every day both inside and out, and on it a plaque: ‘Dr Pete’s Lab’. The door had two electronic panels beside it; the first was a handprint scanner (presumably activated by Pete’s hand), and the second was similar, but it clearly wasn’t meant for a person. In fact, it looked like a match for Roger’s mechanical hand. Cautiously, Roger placed his robot fingers and palm onto the panel, and after a brief moment, a little green light shone, a beep was heard, and the door swung open. He felt a bit reluctant to just walk inside, but soon inquisitiveness got the better of him. The room was completely empty, except for just one item – a big, strange machine in the middle of the room, with what looked like a little door on the front. At first, Roger just peeped in, but before long his quizzical nature had him climbing inside for a better look. Now he could see the machine had sequences of numbers written down the side. They were all four digits long, starting with 1999 and ending with 2320. Could they indicate years? But what could this be? A machine with a door? With numbers? He wondered… could this be a time machine?! 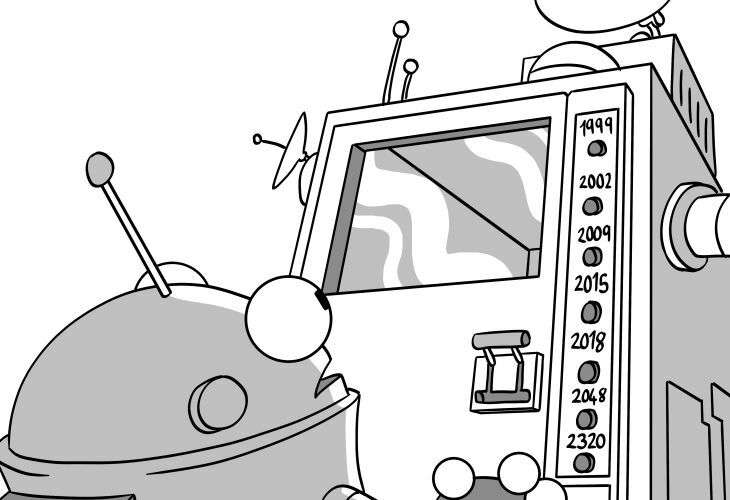 Roger studied the numbers on the machine: 1999, 2002, 2009, 2015, 2018, 2048, then 2320. It turned out that each number was a button. Now, the question was, which one should he press…? Note to the reader: I recommend choosing 2018 last! If you choose any of the others, there’s a link at the end of each of them that brings you back here.